There’s a grumpy guy who doesn’t want his spirits raised, an urchin freezing to death on the city streets, and a trio of musicians with mixed feelings about telling those tales in song. But “Striking 12’’ is not your average holiday show, and not just because the holiday it tackles is New Year’s Eve. “It was described to me as a very atypical, uncommon, unexpected, but wholly entertaining and engaging event. And I said, that’s very nice, but what does that mean?’’ says José Delgado, a performer and the music director for this pop-rock musical, which runs Wednesday through Jan. 2 in Deane Hall at the Stanford Calderwood Pavilion, Boston Center for the Arts, presented by SpeakEasy Stage Company. In “Striking 12,’’ three performers play more than two dozen characters, mostly without letting go of their instruments. The main story is about a present-day Grumpy Guy avoiding New Year’s cheer when he’s visited by a chipper young woman selling full-spectrum light bulbs to battle seasonal affective disorder. When he compares her to “The Little Match Girl,’’ it leads to a retelling of Hans Christian Andersen’s sad fable. And the performers break the fourth wall to comment on holiday show-biz throughout. 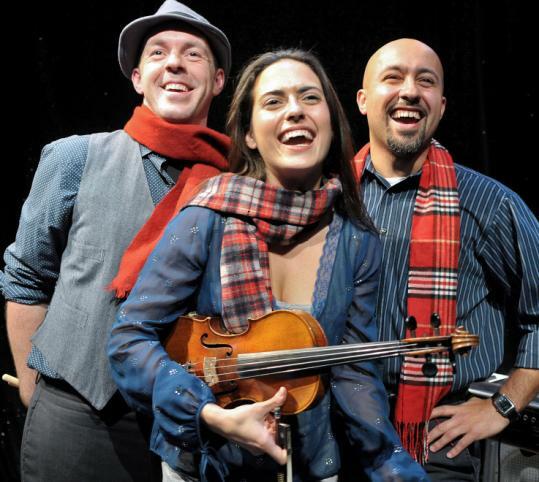 Delgado, a veteran of many Boston theater productions and the Tanglewood Festival Chorus, plays keyboards, sings, and acts alongside electric violinist Erikka Walsh and drummer Zachary Hardy. The book, music, and lyrics are by Brendan Milburn and Valerie Vigoda of the band GrooveLily and Rachel Sheinkin (“The 25th Annual Putnam County Spelling Bee’’). Milburn and Vigoda debuted it with the band’s drummer, Gene Lewin, in California in 2004. Delgado was especially glad to take part in “Striking 12’’ because it’s a show that depends on live musicians. Like many colleagues, he’s been watching as the Boston chapter of the American Federation of Musicians protests the use of pre-recorded music for the “Radio City Christmas Spectacular’’ at the Citi Wang Theatre. “It’s killing me to hear that more and more, live musicians and live music in general are being reduced and cut and marginalized for the sake of the bottom line,’’ says Delgado. “The work my colleagues and I try to do, even with reduced budget and reduced numbers and reduced everything, is to bring out the maximum entertainment value for the dollar, so when people put down their $50-$60 or even $130-$140 and come to see a show, they’re not going to get the CD they can buy for $15 at the store. “I am in eternal gratitude to Paul for taking such a risk,’’ says Sinclair, who adds that musicals are what got him into the business. Presented by SpeakEasy Stage Company. At: Deane Hall, Stanford Calderwood Pavilion, Boston Center for the Arts, Dec. 8-Jan. 2. Tickets: $50-$55.